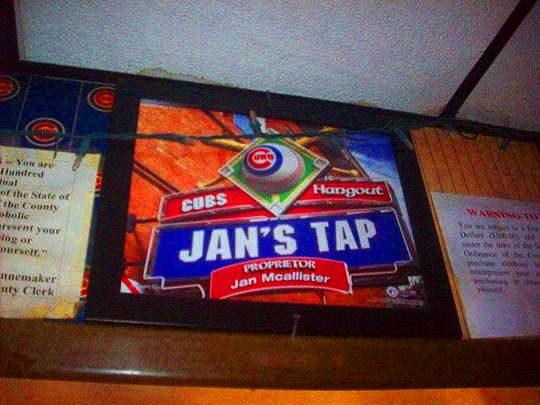 I’ve been meaning to to to Jan’s Tap ever since I read about it in Justin Glawe’s Peoria Bar Review over three years ago. If you need proof of that, just scroll down the post and look at the first comment. And so now it’s time to finally pay a visit to Jan’s Tap on this freezing cold, sub-zero evening. Bundle up, buttercups, it’s cold out there tonight! Holy fuckballs, with the windchill it's like twenty below zero right now, come on car heater, start kicking in! The parking lot here is empty, probably due to the freezing weather outside, but the lights are on, let's see if it's open. Houston, we have an open bar! And there's plenty of seats and it's warm in here, so let's get settled in! Jan, who's the owner, serves me up the first beer of the evening. Jan and her husband have owned this place for 25 years and the building has been here since before 1940. We had a nice chat about Peoria and we both shared memories about one person I'm constantly compared to: Nightlife Sam! Jan was friends with Sam, who I met a couple of times and she had some great stories about him. She also told me she has some issues of "Nearby Nitelife" that she'll share with us in an upcoming post, so stay tuned for that! And she remembered Justin and said to say hi, so hi from Jan to Justin! Here's the view of the bar from my perch. A shot of the trio of taps at the bar. 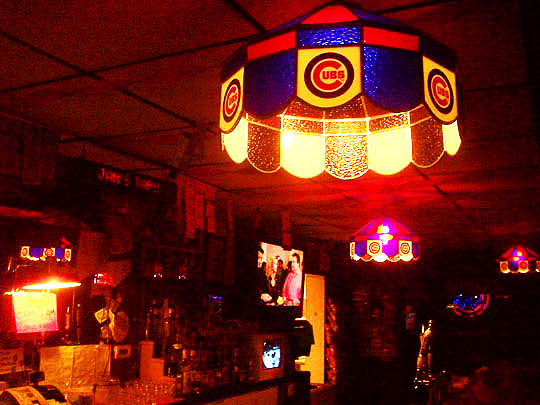 Cub's Country in here, Cardinal fans beware and take note! 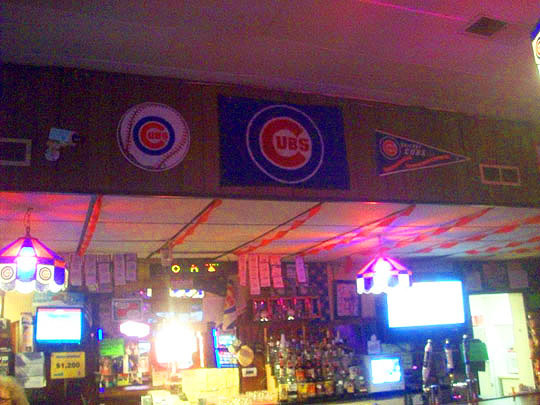 And to further emphasize that point, Cubs pennants and signage hang over the bar. How's about them Cubbies? 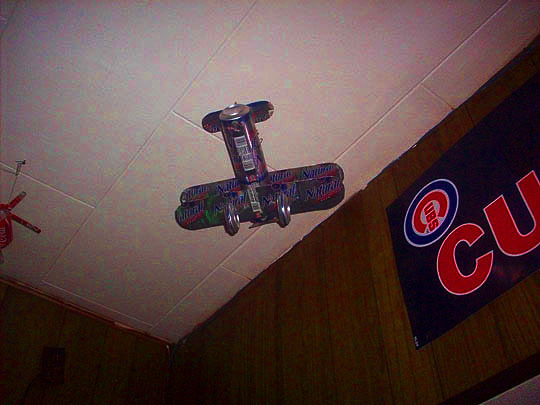 Check out the beer can airplane hovering near the ceiling. Jan told me a customer makes these. And the same person makes these beer can helicopters, very cool! 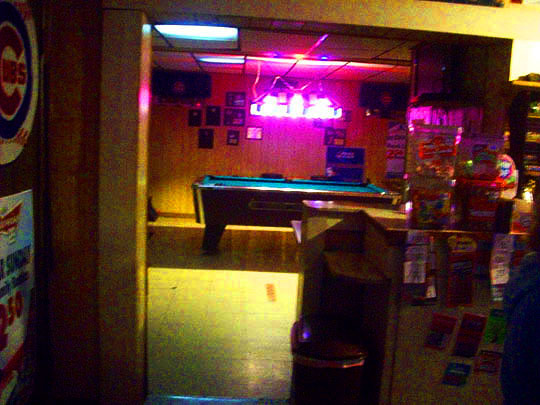 There's a back room just beyond the bar, let's go check it out. 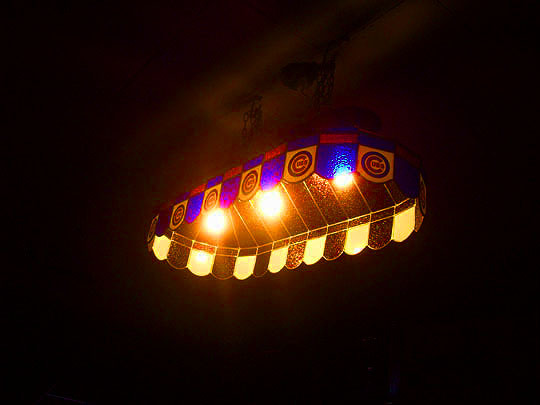 There's a pool table back here with yet another Cubs chandelier overhead. There's also a dart board back here. And if you're hungry, here's the food menu, I think next time I'm here, I'm going to sample the corn dog! Here's a shot of Jan holding down the fort at the bar. Jan let me walk behind the bar to get a few shots of some items back there like this picture of Harry Caray that 's autographed by his wife. Holy cow! 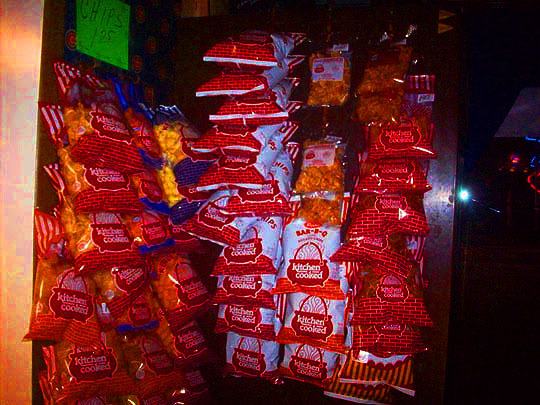 Check out the Peoria Chiefs memorabilia! Jan has a certificate of excellence from our friends at Brewers Distributing Company! Check out the hours here, I think this is a record for Peoria! Tonight was all that and a bag of chips! Thanks to Jan for being a warm and friendly host on a freezing cold night! We'll be back to check out her issues of Nearby Nitelife, so stay tuned for that and hey...let's be careful out there! We'll see you all tomorrow! Related Posts: Two Beers @ The Last Hurrah, AmVets Post 64 and The Variety Club. Sometime I don't think about nothing but the Monkey Man.